Non-volatile memory maintains programs indefinitely while timekeeper circuit keeps time during power outages. No batteries required. 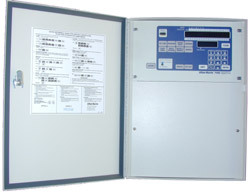 Capable of resuming any program in progress upon power restoration. Electronic overload protection with automatic reset. No fuses or circuit breakers. 18-gauge Jet Coatï¿½ cold rolled steel cabinet with a powder-coated finish suitable for wall or pedestal mounting. 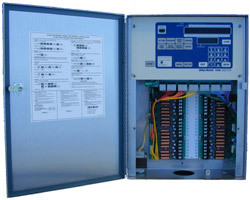 Optional heavy-duty lightning and surge protection. Comes with a limited 5-year warranty. Ability to start or stop a program allows for any program or station to run manually from 1 minute to 9 hours 59 minutes in 1-minute increments. Total flow control when connected to a Rain Master Flow Sensor. Programmable flow limits and mainline break detection. 4 independent programs capable of running concurrently with 5 independent start times per program. Programmable master valve for any of the 4 programs. Programmable overlap protection allowing programs to be run in a "stackedï¿½ mode or concurrently. Cycle and Soak feature to eliminate runoff and conserve water. Programmable watering days based on a 7 day, skip by day, with up to 30 days between watering. Programmable input for sensor devices allows for enabling of a device on a per program basis. Visual indicator for sensor device status indicates "sensor wet" or "sensor dry". Program water budgeting from 0 to 300% in 1% increments. Programmable timer delay between stations allows the user to program a time delay from 1 second to 256 seconds (4 minutes 16 seconds) to allow slow-closing valves to completely shut off. Programmable rain shut down allows the user to select the number of days the controller will stay off (in rain shut down mode) before it goes back into the automatic mode. Field wire fault detection identifies field wire shorts and automatically shuts down the offending station and moves on to the next station. Audible alarm warns of field faults or station malfunction. System check that runs each station from 1 to 9 minutes. 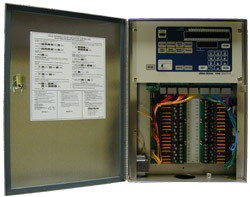 Detachable harness connectors that allow for quick access to front panel without disconnecting field wires. Manually activated program cycle allows the user to run a program independent of its programmed start time and water days. Manually activated station cycle allows the user to run a single station for a selected time. Advanced features when used with Sentar.